Cross-border flows of goods, services, capital, people, and even ideas are today more contested, at least in advanced economies, than they have been since the fall of the Berlin Wall. Trade agreements, which constitute a rare tangible legislative symbol of globalization, are bearing the brunt of the controversy. Last-minute objections from French-speaking Belgians nearly derailed a bilateral deal between Canada and the European Union. The Trans-Pacific Partnership involving the United States, Japan and 10 other Pacific Rim countries faces an uncertain fate in the US Congress. A proposed trade agreement between the EU and the US now appears a distant project. These views are wrong. A turn inwards would bludgeon people’s purchasing power. A recent study of 40 countries projected the effects of closing off cross-border trade: the richest tenth of consumers, who spend more of their high incomes on non-tradable services, would lose a not-insignificant 28% of purchasing power. The bottom tenth of consumers, however, would face a 63% loss. 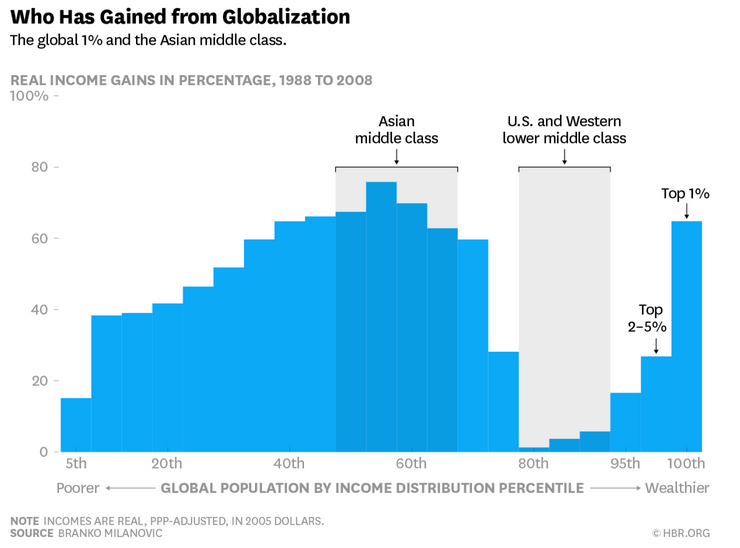 There’s an even bigger reason globalization is worth saving: the open global economy has helped lift over a billion people out of extreme poverty. Predictably open markets made it possible for countries to drive rapid growth by hitching their wagon to the world economy, and using global demand to pull people and resources out of subsistence activities into more productive work. Had trading partners slammed the door shut the moment competition from West Germany, China, Kenya or Vietnam made them nervous, there would have been no growth and development miracles – and the money in your pocket wouldn’t go as far as it does today. Trade agreements keep markets predictably open – or at least have thus far. While trade is easier to blame, much of this is due to technology. Ever since the first power looms put weavers out of work in the late 18th century, technology has increased productivity but threatened jobs for humans. In recent decades, automation has wiped out millions of relatively low-skilled factory and clerical jobs in developed countries. And now, increasingly intelligent robots in the Fourth Industrial Revolution could potentially replace entire classes of workers, from truck drivers to lawyers. In the meantime, domestic policy decisions in many countries have cut taxes on the wealthy, neglected labour market adjustment, and discouraged unionization, exacerbating inequality and insecurity. But trade has undeniably been a factor. The factory work that lifted millions out of poverty in places like China and Vietnam probably did cost some workers in North Carolina and Wallonia their jobs. The prospect of offshoring, real or otherwise, has weakened labour’s bargaining power with respect to capital. The fact is that during the post-1989 heyday of globalization optimism, political and business elites did not think enough about the prospect – plainly predicted in economic theory – that trade would harm some people even while leaving society as a whole better off. The result was overpromised benefits and inadequate adjustment plans. And now, especially in communities left behind by trade and technology, fear over future prospects has created fertile soil for populist demagoguery. A silver lining is that inclusivity is now at the heart of the trade agenda. Making trade more inclusive requires action on three broad policy fronts: trade rules, domestic social protection, and international cooperation to complement the first two. Governments should concentrate political capital on issues in trade negotiations that deliver broad-based benefits. Improving purchasing power is one key. Another lies in greater participation by small and medium-sized enterprises, which account for the majority of firms and jobs in any economy. Reducing fixed costs related to trade – from complex border procedures to the regulatory burden arising from product standards and other non-tariff measures – would yield disproportionate gains for smaller firms. Done right, it would not undermine product quality or consumer health and safety protections. All countries, not just developing economies, may need to make more investments on the supply side to help smaller businesses connect to world markets. To address the disruptions and the distributional effects of trade and technology, governments need to respond across the board with investments in human capital, education, skills and vocational training to better match people with job opportunities. Active labour market policies will need to be coupled with measures to soften the blow of under- or unemployment, from higher minimum wages and wage top-ups to universal basic incomes. Redistributive policy is not solely an issue for advanced economies. 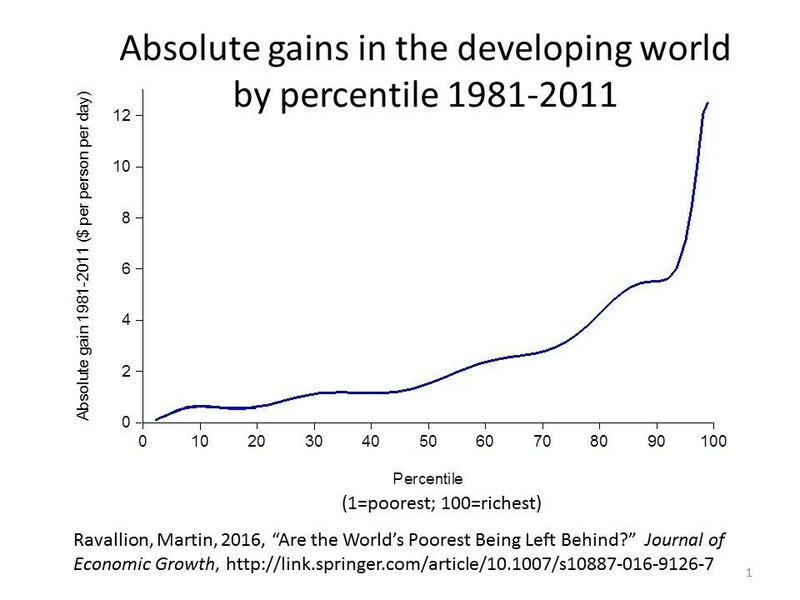 As Martin Ravallion has shown, for all of the progress in reducing extreme poverty, the biggest income gains in developing countries have gone to the better off. Unless governments act effectively to expand opportunities for all, they too may eventually face a backlash of frustrated ambitions. Neither of these agendas will be cheap. Cooperation to curb corporate tax avoidance is one example of how governments could usefully work together at the international level to raise the revenue they need to keep citizens on board with globalization. Global companies with a long-term view should support this agenda. Essential in all of this will be political honesty. While reviving growth would do much to ease economic angst, shoring up the fragile social license on which open markets rest requires government and business leaders to be up front with people. Trade, like technology, is good for most of us, but not everyone. More market opening needs to come with more redistributive social policy. That has a cost. And if anyone thinks it’s not worth paying – consider the costs of a backlash. This article is adapted from the 2016 J. Douglas Gibson Lecture delivered at Queen’s University, Kingston, Canada, on October 17, 2016.